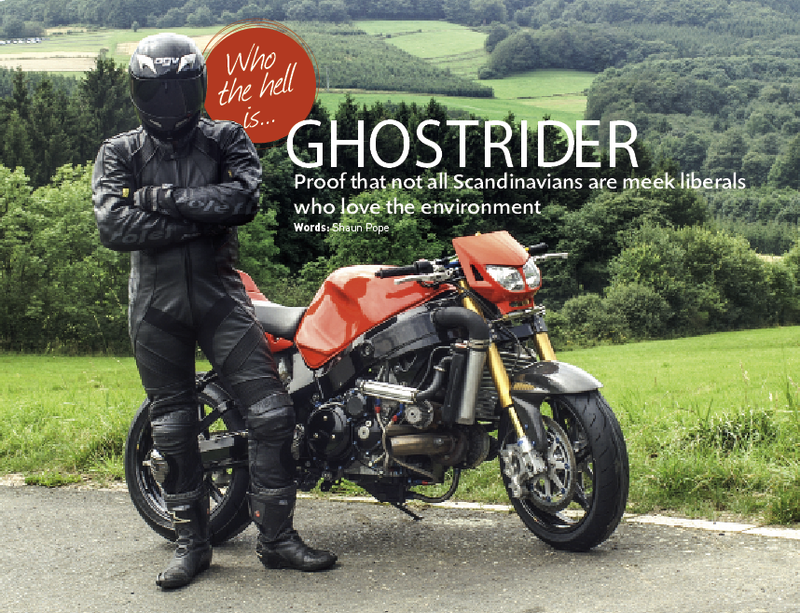 Based in Sweden, Ghostrider’s been making films about high-speed road rides for more than a decade. 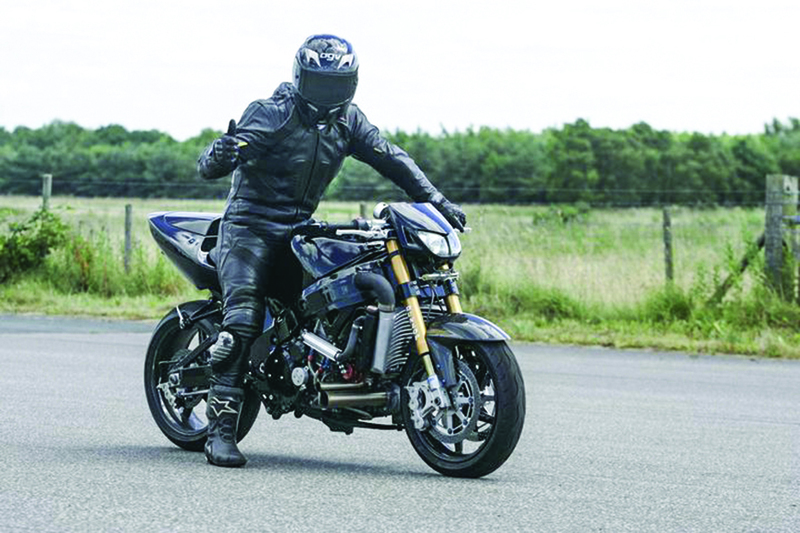 Widely rumoured to be Patrik Fürstenhoff plus his mates, the black-clad stunt rider did the Top Gear ‘Stig’ thing early on, and keeps his identity under wraps. 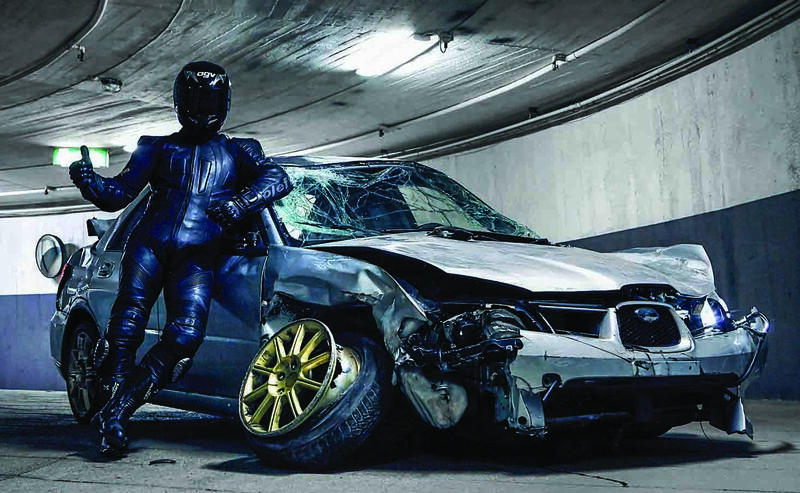 His films have been big underground hits, with the crazy road riding, police chases and high-speed stunts cheering up thousands of bikers for years. Here’s a bit more of his story. 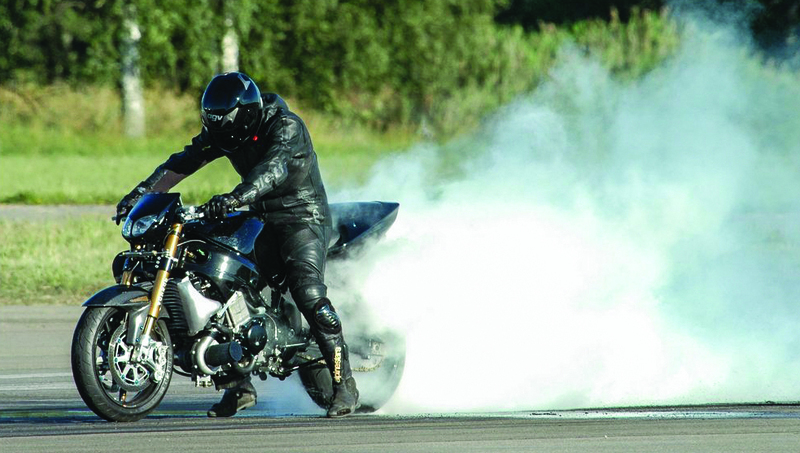 SuperBike: What was your inspiration to start making the Ghostrider movies? Ghostrider: It all started back in 2002 with ‘Ghostrider – The Final Ride’ which seems like an odd title to use seeing as it was our first video, the truth is there was only ever meant to be one film and nothing more. Back then the internet was really exploding with popularity and our video spread like wildfire. In the end there was such a demand for a follow up that we ended up making a sequel and then a third a fourth and so on. The main reason behind ‘Ghostrider’ was because of this Swedish car film called ‘Getaway in Stockholm’. Although I have to tell you that everything they did was fake! The police in the videos were fake, the speeds were fake, it was all set up. So I sat down with some friends and we agreed to make a video that was completely real and to make it as crazy as possible, I think we achieved that with the first movie. Of course twelve years ago there were no GoPro cameras and so we had to use quite a large Sony camera taped to the tank. It cost about £5,000 and the quality wasn’t the best if you look back at them now. We moved on to using bullet cameras from DogCam motorsport who are based in the UK and they were pretty good actually, great for night time shooting. We now use the modern equipment that is widely available to everyone. Why do you always used Suzukis in the films? In the early days it just so happens that I had the K1 Suzuki GSX-R1000 and we were using what we had available to us. In later movies we continued using GSX-R1000’s more as a security measure than anything else. We’ve only ever had one breakdown over the years whilst using Suzuki bikes, they are built like tanks, especially the engines. 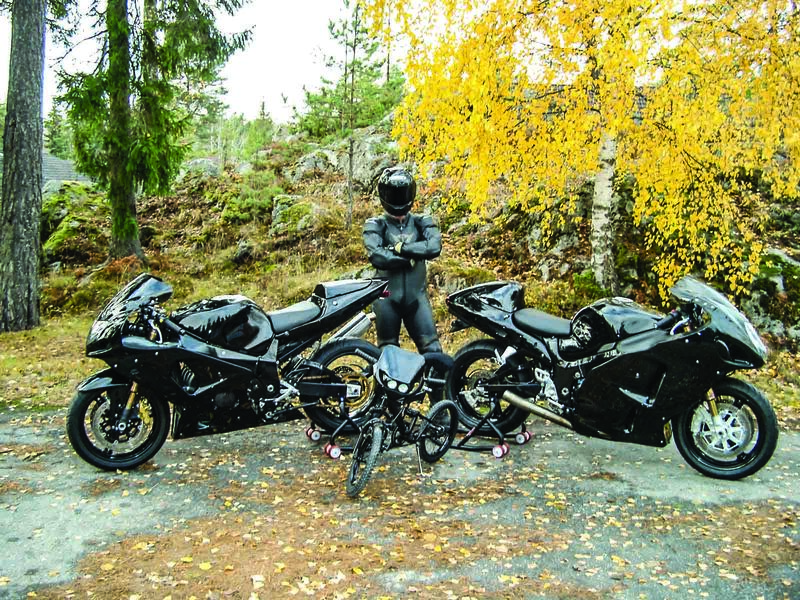 No one could race between Stockholm and Upsala on a Yamaha R1 and expect it to stay in one piece. We used an R1 back in 2004 that was given to us by Yamaha Europe and it broke down within a couple of weeks. They just can’t handle things like a 5km wheelie because you’ll get oil pressure issues, the GSX-R can take that without a problem. I’ve been racing for many years on the tracks in Sweden and in around ’99 we put together something called ‘The Swedish Wheelie Team’. We came to the UK for the first time for a fastest wheelie record attempt that Gary Rothwell was also a part of, it was a big thing with TV coverage at the time. I think Gary Rothwell is a cry baby and I don’t really want to repeat his name any more, you can happily quote me on that! Anyway we came to Bruntingthorpe for the event and we were receiving help at the time from West Coast Motorcycles and Gary was also getting support from them. A lot of guys dropped out before the event and it ended up with Gary being the only one who actually showed up at the airfield, together with me. During a test run at the start of the day his engine blew up. I took pity on him that he couldn’t make an attempt at the record and it was a bit embarrassing that I was the only one there with a working bike who was going to make an attempt at the record. I was young and foolish and I stupidly agreed to let Gary use my Honda Blackbird for an attempt at the record, it was one of the stupidest decisions I’ve ever made in my life. I made it clear to Gary that I would let him have ten runs on the Blackbird and no more, which he was aware of. Within two runs he had broken my clutch! In five years of using turbo bikes I had never once had a clutch failure and yet Gary managed to fry the thing within two runs. 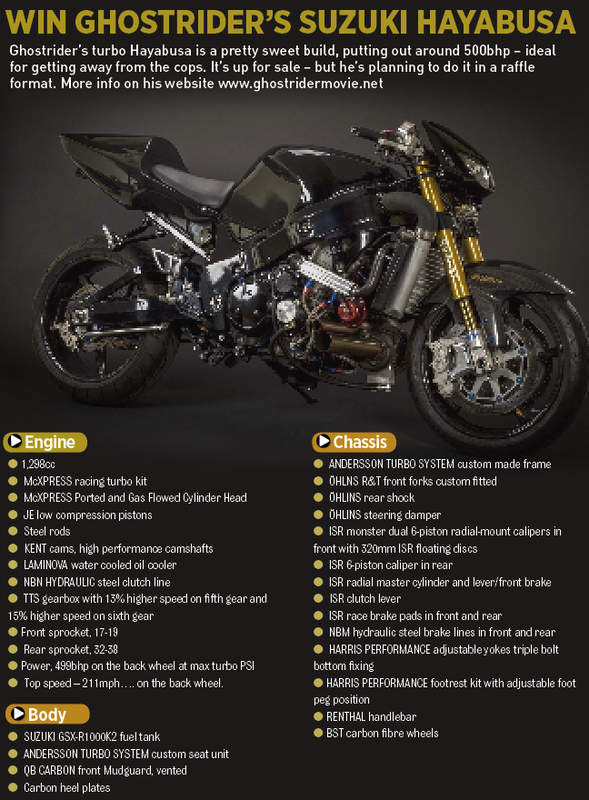 We headed back to West Coast Motorcycles and they were able to take a clutch from another bike that we could use and we returned to Bruntingthorpe the following day. Gary had done far too many runs, way more than the ten we had agreed and in the end I took the key off him. He’s been crying like a baby about that day ever since then. The fact is I set my last record in 2003 over in the UK and he had the opportunity to come along to challenge me, but he didn’t. Don’t get me wrong Gary Rothwell is a good rider, he’s good at wheelies. But he’s always coming up with these huge excuses about why he can’t take part and it was part of my decision to ultimately stop attending the Elvington wheelie event after opinions became so polarised. How do you get away with putting your DVD’s on sale in public? Is there a difference in Swedish law that lets you get away with it? Most countries are actually the same from a legal point of view, it’s only the UK that is the main exception. I heard about a British group who made their own DVD called ‘Stupid Riding’ and we met at the British Motorcycle show a few years back. They attracted some police attention and had their doors kicked in and were hauled up in court and so on, it’s not as easy to get away with these things in your country! The Swedish law is good in one respect and bad in another, the rules are that police can’t just record a numberplate of a vehicle or assume a certain individual was driving if an offence has taken place. They need to catch you red-handed there and then, bring you to court and present video evidence to prove it was you who was driving or riding. We don’t have speed cameras like you guys have either and we don’t use numberplates in the Ghostrider videos so it’s not a problem anyway. I think the Swedish police prefer to use scare tactics and propaganda to deter people from speeding but when it comes to actually catching speeders it’s a different story. The police here do have helicopters but they aren’t used to catch speeding cars or bikes and are only sent out for special circumstances and I think the police are reluctant to use them after an incident a few years ago in Stockholm. A biker was being chased with a helicopter overhead and scores of police cars on his tail and he tried to escape into a tunnel which was closed off. It was his own fault and of course he could have stopped but he didn’t, and a metal cable across the tunnel entrance took his head off. Since then we don’t see them using the helicopter for pursuits. There was one incident where the GSX-R holed the radiator and I crashed on the fluid that escaped, hitting a lamp post. The frame was broken in half and I just abandoned it at the side of the road but I wasn’t caught. Speaking of crashes I had a big one at the Nurburgring a few years ago when one of the cameras on the bike came loose and jammed in the front wheel. I was fine and the German police had nothing to say about it as there were no laws broken. The Nurburgring even granted us permission to use cameras around the circuit, something which rarely happens and on the third lap I had the crash. Three corners later and I’d have been over Flugplatz and into the really fast left which would have ended badly, thankfully I wasn’t travelling that fast and escaped injury, the bike was a different story. The place still gives me goosebumps though, it’s still the best track in the world and I’m happy to hear there are new owners who will run it properly. You mention on your website that illegal downloads of your videos have put future Ghostrider projects at risk. Can you tell us the extent of it? Some people have said we are whining about it but the situation is like this – Ghostrider number five didn’t make a single penny in profit, after everything was paid for it only just broke even. The sixth video made a loss of at least £50,000. People need to understand that making these videos and distributing them costs big money. We still enjoy making these videos of course but such a big financial hit is difficult to accept as it’s so easy for people to go online and download the movies for free. The DVDs have been pretty popular in the UK through the contract we had with Duke Video but even so we were only making a pound on each DVD sold, so you can see that nobody was getting rich any time soon. The DVDs were also on sale in Japan, the USA, Australia and so on but they were one off deals. People think it’s a good business making these films and sadly it just isn’t when you’re down by fifty thousand pounds. Tell us about the Subaru incident. In the latest DVD we decided to add some more car action to things and we got hold of a crash-damaged Subaru Impreza from Germany. We only bought the car for the spare parts but when it arrived on the truck it was drivable so we now had a damaged but fully-functioning Impreza to go along with our already mint condition car. It was an opportunity for us to do something a little bit different. We staged a crash scene where the best Subaru was filmed locking the brakes and supposedly hitting the barrier. We’d then switch to the damaged car for the next scene to make it look as if it had been in a big crash. We even drove the damaged car home and it was a right state having been crashed so many times, even so, the police ignored it. What wasn’t staged was the Impreza scene involving the police Volvo in Stockholm one evening. We decided to do one last run in the Subaru and took it out onto the road one evening. It was within 300 metres of leaving the garage that we caught the attention of the first police car and we were caught up in chases for the next few hours involving about 20 police cars who were out to catch us. While all of this was going on, one policeman was standing watching the action and he decided he would end the chase himself. Eventually our Impreza came up behind him and he had already made a clear decision to swerve and crash into us to end the chase, he was out to make a point. And he did it! Almost. He flipped our car up onto its side at a 90 degree angle and we skidded along the central reservation before luckily landing back the right way up with the help of a lamp post. We got away but had suffered a puncture in the crash with the police car and had to ditch our Subaru. The police found it and used huge resources that night looking for the driver, but as I’ve said the law is not on the side of the police unless they catch the driver in the act. Escaping in a car is obviously much more difficult, especially since the police started using road blocking techniques which are easier to escape from on two wheels. I’ll tell you a little about the Suzuki Hayabusa Turbo that I ride in a few of my videos. Built by MC Express it currently runs 1.2 bar of boost, making 439bhp at the rear wheel running on standard 98ron pump petrol. We’ve had it up to 500 but at that figure the cooling can’t cope and the bike overheats a lot, we’ve still got it on video though pulling a wheelie at around 211mph.